Protesters march through the streets of Tokyo every weekend to demand the prime minister's head on a pike. The crowd chants, "Curse you, Abe!" But one man means it literally. Oda Masanori, better known by his activist moniker Illcommonz, infuses social disobedience with witchcraft he learned from an East African shaman during field work in the early 90s. 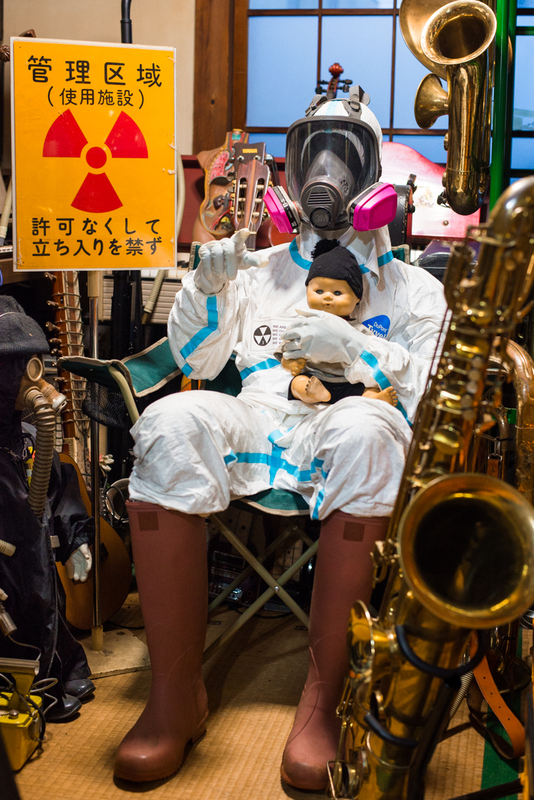 His recent exhibit of home-made disobedient objects at Irregular Rhythm Asylum, an anarchist bookstore in Shinjuku, culminated on September 21st with a jazz concert to wish Abe the worst on his birthday. His credentials are more proven than his methodology. Aside from his position as part-time lecturer at Chuo University and Hosei University he's written for leading art and academic journals on topics ranging from cultural anthropology to anti-nuclear protest. Turns out he's not nearly as intimidating in person as he is on paper. Speaking with him at his west Tokyo apartment that's part workshop, part steel truss bivouac gave me the impression that his brand of voodoo activism owes as much to the theatrics of his Kenyan shaman as it does to the films of Carpenter and Romero that use horror as a tool for social commentary. What is the deal with voodoo activism? It's a term I made up to describe political or social activism that achieves its goal through psychological, spiritual or superstitious means such as spells, curses and chants as opposed to physical means such as destruction and violence. Can't you get in trouble for this? How is a hex different than a death threat? 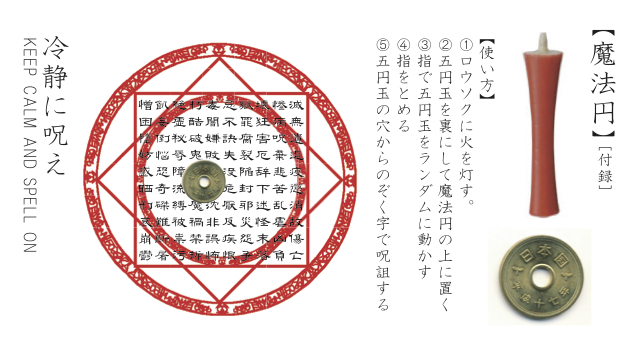 Curses are protected under Japanese law by the impossibility defense. They're viewed as factually impossible. You can't be convicted for a curse. How convenient! (Laughs) I can curse Abe and the LDP to my heart’s content. There's a historic precedent. In 1968 the government recognized that pollution from chemical factories was causing Minamata disease, a mercury poisoning epidemic in Kyushu. But the management didn't clean up their act or compensate the victims. So monks rallied. They chanted Buddhist sutras to curse the factory owners to death. It's unscientific, it's unproven, but it's the root of voodoo activism. People protest the Cabinet’s decision to reinstate collective self-defense with shouts of "kill Abe!" or "die, fascist!" It reminded me of the “Stop the killing” full-page ad that Okamoto Taro ran in the Washington Post to protest the Vietnam War. I did my own flip on this graphic in 2003 during the anti-Iraq War demonstrations and figured I could use the flag to power the curse of protest. DIY magic circle part of curse kit sold at exhibit. During this year's World Cup a Ghanaian witch doctor made the news for cursing Portugal player Cristiano Ronaldo. Two weeks later, a Brazilian witch doctor binds the feet of voodoo dolls to prevent the Germans from running on the field. It ended as a historic loss for Brazil. (Laughs) But it's interesting how mass media facilitated local culture on the international level. This was after the censorship incident last February at the Tokyo Metropolitan Art Museum. One artist displayed a kofun burial mound plastered with anti-government messages. The curator demanded the messages be removed on the the grounds that text wasn't appropriate for a sculpture exhibit, but it was totally for political reasons. I figured, if you can't protest in public, let's do it in private. 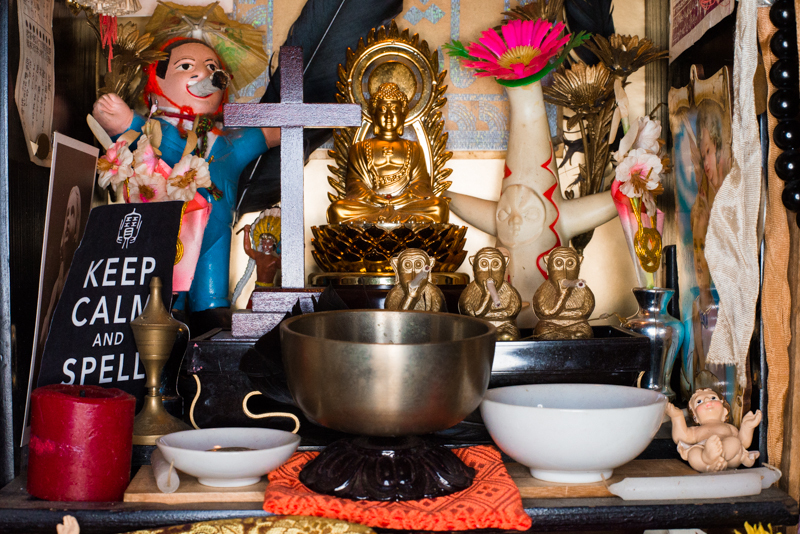 Why mix different world religions at the exhibit? During my field work I discovered traditional witchcraft thriving alongside a predominantly Islamic population. Orthodox religion hates mixing elements but there it was, a sort of Islamic witchcraft. For example will carry thumbnail-sized books of scripture for luck. Off the top of my head I can say the exhibit contains elements from Christianity, Islam, Taoism, Buddhism, Shinto, Hinduism and indigenous African beliefs. 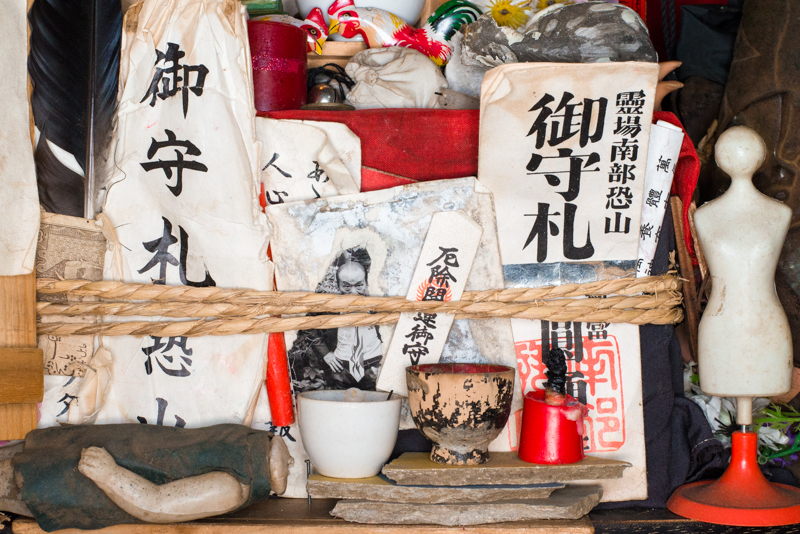 I picked up the wooden effigy in Zaire and the hitogata paper charm nailed to it is from Shinto. They both protect against thieves like Abe who'd steal our democracy. Going back to your fieldwork in Kenya, what is the role of a shaman? Officially they're doctors who use divination to treat sickness and depression. But they play a secret role as a hex caster. See, Africans care about equality. If your brother is rich while you're poor, or your sister has children while you have none, the shaman will curse them to restore the balance. So the curse is born from jealousy, not hate. Right. The shaman is also a sort of exorcist. Say an evil spirit steals the soul of its host--that's the source of the problem. The shaman will communicate with the spirit to learn what it did with the soul, then gather six to ten people to search the village while playing instruments. In a few hours the crowd will swell to 200 or more and that's when they find the soul, maybe deep in a cave or at the foot of a river. 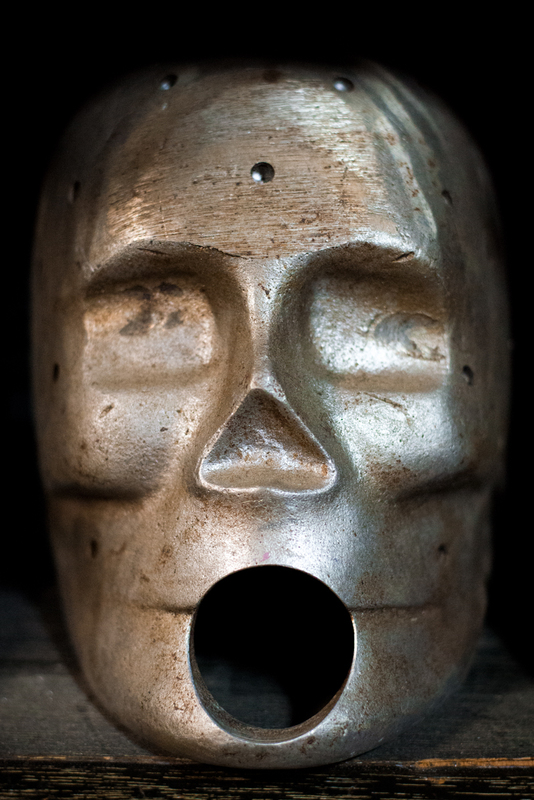 Then the shaman puts the lost soul inside a gourd, carries it back and puts it on the head of the patient to reunite them. The whole spectacle is pretty out there. The thing is, for my shaman his performance wasn't part of any tradition. It's a gag he came up with that spread on its own. So the shaman is more than a mere healer. He's a creator, an artist contributing to society. Did your shaman believe what he preached? Some are fundamentalists, some are performers. Their methods aren't scientific but they get results. Imagine you've got depression. Suddenly the whole community comes together for you to sing and dance until dawn. What an amazing mental support group! It shows that you're not alone. It gives you a reason to live. You use music for the opposite effect. I snap up broken instruments from Yahoo! Auctions and restore them myself. Except I mod them to sound worse to turn the instrument into a protest tool. How did the the exhibit and live curse session turn out? It's too soon to say. The curse is a slow action. You don't know when it'll come to pass. It could be in two weeks, or two years. Compare that to a public demonstration. The news coverage puts immediate pressure on politicians. But once the crowd disperses, so does the energy. A curse is secret. It's continuous. It's slow-burn political action. But Abe is bound to self-destruct. I'm sure we'll see results sooner than later.